Working with a recruiter who understands your field and your professional career objectives can be an incredibly beneficial resource in your job search. A few days ago I was looking at a competitor’s website, and saw something that shocked me. There was a particular service offering that, for an upgraded package price, gave their customers the option of having their resume distributed across their network of recruiting contacts and affiliates – to some tune in the thousands. Recruiters compete with other recruiters (agencies and individuals) for the fee associated with introducing your resume and placing you with an organization. Depending upon the complexity and level of the role, these fees can range anywhere from 10-25% of a candidate’s base salary (paid by the employer, of course). This is a huge investment for a company, and they will be fastidious in looking for any red flags associated with the deal before writing out that check for $25,000. For instance, if your resume is passed on to a company by two (or sometimes more) competing recruiting agencies, it can cause a heated debate around who presented the candidate first. Agency A might have presented the resume a day before Agency B, but Agency B is offering a lower conversion fee agreement, which could potentially save the hiring company thousands of dollars in an already tiring budget. But wait, then there’s Agency C who has an exclusive recruiting contract with the company to begin with, so technically they should be the ones to represent the candidate, and no one else – otherwise, the company is in violation of their contract. It can get very tricky because many agencies will have contracts in place stating the rates and stipulations that the partner companies have to adhere to. And in many cases, it’s not worth the time, effort, and potential legal ramifications of dealing with the competing agencies. In other words, the hiring company will forget your resume altogether, and move onto the next candidate who promises far less drama. There is a further consideration to look at here. You don’t even know WHO is presenting you to WHAT COMPANIES. So now with your resume in the hands of hundreds of eager recruiters, you’re potentially getting rejected from jobs you didn’t even (yet) apply to. And forget trying to reapply on your own – because if either agency finds out the position was filled with a candidate they presented, no doubt that reciter will be that company’s office the next day, and you may end up losing a job offer because of someone else’s oversight. Unfortunately, I’ve seen it happen. Not from my agency, but certainly from others. The point is to be aware of who has ownership of your information and to keep the control in your own hands. This means being selective about what recruiters you choose to have a relationship with, and whom you allow to represent you to potential employers on your behalf. Identify a recruiter (or even up to 2 or 3, max) who ideally specializes in your field or niche, as their connections will be much more meaningful and strategic to your industry, and they will also know how to position your qualifications. Ask what kinds of companies they work with, and what their record of placement and retention success is. 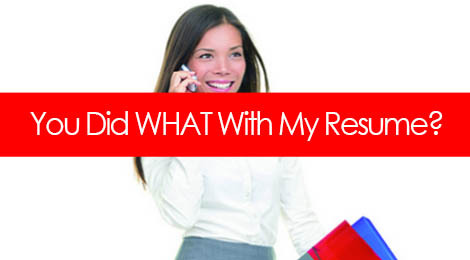 Ask for references from candidates (or client companies) whom they’ve placed, or placed with, in the past. Never work with someone who requires payment from you. No recruiter will ever solicit money from a candidate – they get paid by their client companies when they make a placement, and that’s the only way they get paid. Don’t call a recruiter a headhunter – they hate that. Why? Because they’re different – headhunters charge candidates for their services, while recruiters, again, charge the organization. Working with a recruiter in your job search, though it sometimes gets a bad name, can be an incredibly lucrative partnership. They have access to connections and hiring managers individuals often can’t reach, and that alone can help you stand out. But remember that this is a business transaction, and you want to work only with someone whom you completely trust with effectively selling your product (you). Tags: career, job search, marketing, personal branding, recruiters, resumes. Bookmark the permalink. Should You a Have Professional Bio?